The above preliminary sketch was rendered by Fort Lauderdale, Florida Architect RICHARD ALLEN ROSE on December 1, 1967. Mr. Rose prepared the sketch at the request and on the basis of a concept described to him by Dr. Mark A. C. Karras. Mr. Rose captured his client's notion in a creative and inspired manner. The design, along with all its contemporary implications, is also reminiscent of the domed structure and history of Hagia Sophia in Constantinople. On October 30, 1990, Karras approached The Honorable Art Agnos, then Mayor of the City of San Francisco, with a written proposal as excerpted below. Both the project proposal and the Mayor's response are reproduced in this page for public viewing and consideration. It is fitting to mention that the proposed structure lends itself to a variety of cultural functions, such as musical concerts, lectures, classical theatrical performances, art displays and the like. Furthermore, the Mayor's response was not affected by the above architectural design, because the design was never submitted for consideration. This unique structure will embellish the Bay of San Francisco, will punctuate the presence and identity of the Pacific rim, and will also become a global symbol and source of inspiration: New York has its Statue, Sydney its Opera House, Athens its Parthenon, Paris its Tower, Tokyo its Mount Fuji, San Francisco its Golden Gate, London its Big Ben, Seattle its Needle, Rio its Sugar Loaf. What is then to be said of the farthest reach westward, the Pacific Coast of The AMERICAS? (See: newbyz.html for more background). 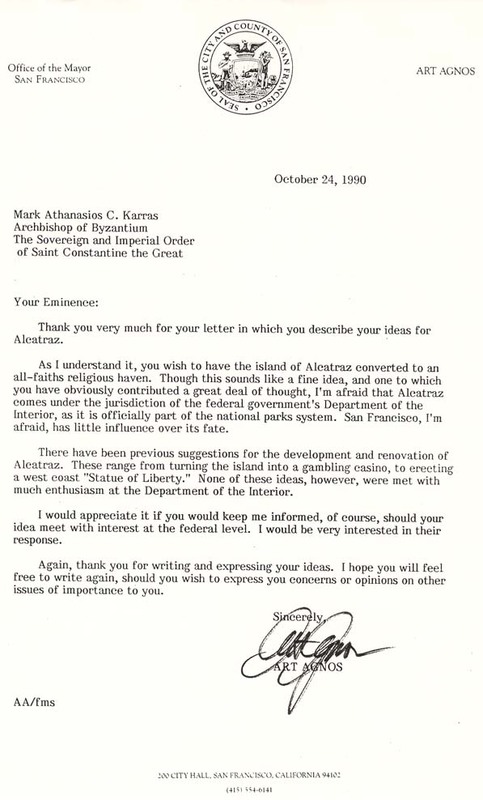 "On this occasion, I submit the following to your Honor (your being literally the first person to whom I present this thought): That is, convert the Island of Alcatraz to an all-Faiths religious haven where people from all over the world will come to visit. Raise up a new St. Sophia in the center in full grandeur, surrounded by other marvelous architecture of other religious Faiths. Let the funding come from all over the world and create a precious spectacle to be admired from near and afar by day and by night in glittering outlines. It is a vision of a New Jerusalem in isolated beauty." 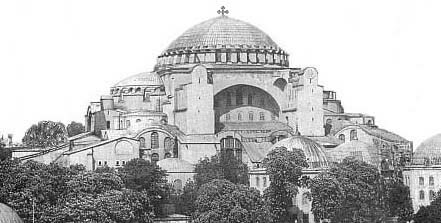 "The next morning the city was shrouded in fog, unheard-of at the end of May; the same night the dome of St. Sophia was suffused with an unearthly red glow that crept slowly up from the base to the summit and then went out. This last phenomenon was also seen by the Turks in Galata; Mehmet himself was greatly disturbed . . . . " (Norwich, John Julius. . A Short History of Byzantium [p. 377]. New York: Alfred A. Knoff). "And I looked, and, behold, a whirlwind came out of the north, a great cloud, and a fire infolding itself, and a brightness was about it, and out of the midst thereof as the colour of amber, out of the midst of the fire." (Ezek. 1:4, KJV).